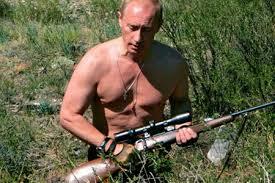 Obvious GOP candidate for 2016: gun-lover, gay-baiter, hates liberals. And you can see Russia from his house. There’s lots of nonsense being talked about how the Republicans don’t have a natural candidate for 2016. In fact, there’s someone with (1) huge name recognition; (2) a strong anti-gay record; (3) unlimited willingness to violate human rights in “anti-terrorist” campaigns; (4) a love of weapons and cheap machismo; and (5) no liberal tendencies whatsoever. Mitt Romney praises him. Â As an extra bonus, you can see Russia from his house. Ted Cruz, eat your heart out!